What the who is that? 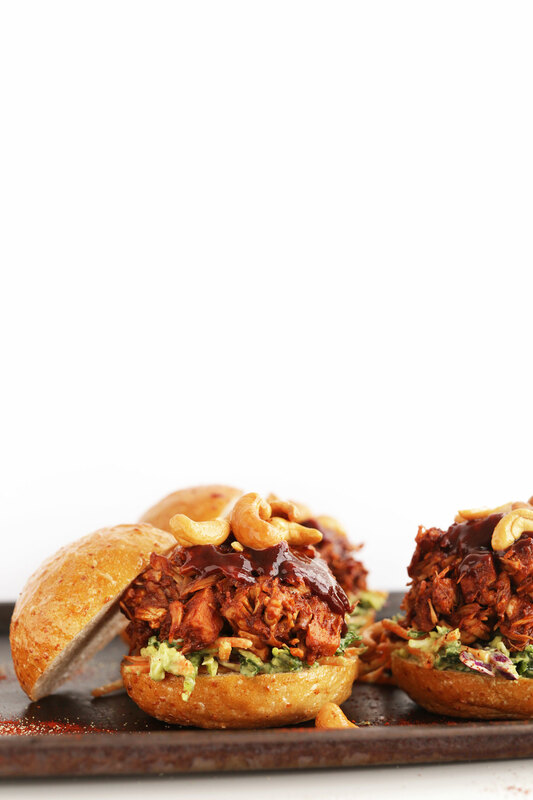 It’s BBQ jackfruit – aka the ticket to reclaiming your favorite BBQ sandwich. This recipe was inspired by the talented folks at FuD – a vegan eatery in Kansas City. When we were still Midwest dwellers I had the chance to eat at FuD several times and was most drawn to their faux meat dishes using jackfruit. I’d seen jackfruit in Asian stores before and just thought it looked like a giant green eyesore (because that’s what it is). However, I had no idea that its texture lends itself to mocking meat and absorbing just about any flavor you throw its way. In other words, it’s a vegan’s dream food. The only ingredient this recipe requires that’s likely not lying around your pantry is green jackfruit, which can be found at practically any Asian market and on Amazon. NOTE: Just be sure it’s young green jackfruit in water, not brine or syrup. This is key to achieving proper flavor and texture. 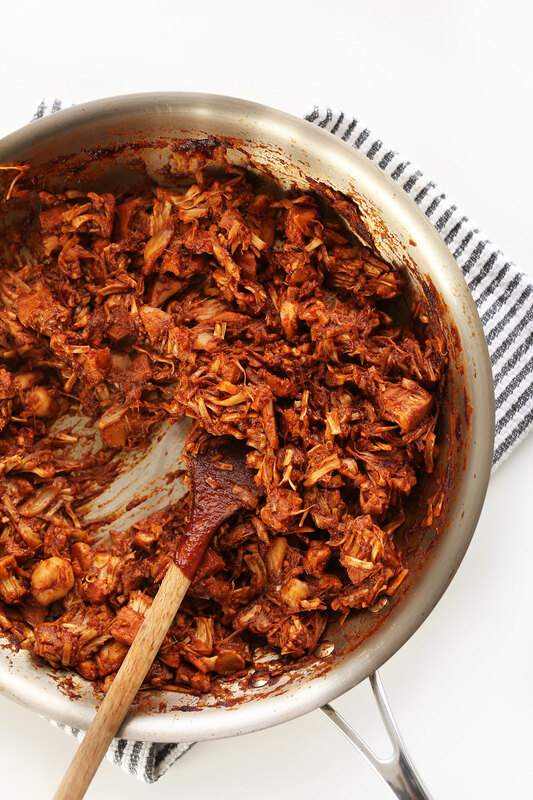 BBQ jackfruit in just 30 minutes that will fool any carnivore into thinking they’re eating pulled pork. This stuff is legit. To add more flavor and texture to the mix, I include a quick avocado veggie slaw that’s easily prepared while the jackfruit is simmering. Even the novice can make this sandwich. All that’s left to do is sit back and watch your friends marvel at what they’re eating. I’ll never scorn the jackfruit again, no matter now ugly and weird it is. If you try this sandwich, let us know! Take a picture and tag it #minimalistbaker on Instagram! We’d love to see what you come up with. Cheers! 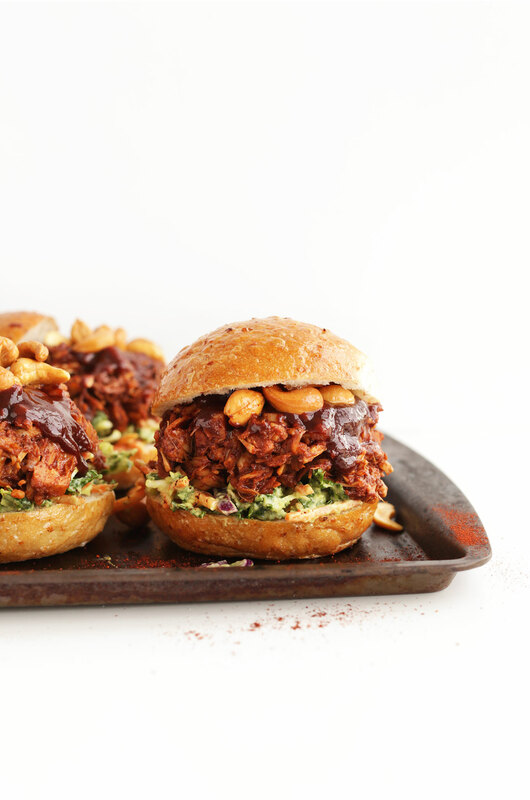 Simple, 30-minute BBQ jackfruit sandwiches that will fool any meat lover! A crunchy, cool avocado slaw and roasted salted cashews add even more texture and flavor. The perfect vegan substitute for pulled pork. Rinse, drain, and thoroughly dry jackfruit. Chop off the center "core" portion of the fruit and discard. Place in a mixing bowl and set aside. Heat a large skillet over medium heat. Once hot, add 1-2 Tbsp oil of choice and seasoned jackfruit (use more oil, as needed, if increasing batch size). Toss to coat and cook for 2-3 minutes to achieve some color. Add BBQ sauce and thin with enough water to make a sauce. Stir and reduce heat to low- medium and cook for about 20 minutes (up to 35 minutes on low for a deeper flavor). Remove lid and stir occasionally. TIP: For finer texture, use two forks to shred the jackfruit as it cooks down. In the meantime, make slaw by adding all ingredients except vegetables (avocado through salt + pepper) to a small mixing bowl and whisk to combine. Thin with water until a thick sauce is made, then add veggies and toss to coat. Set in the refrigerator until serving. Once the jackfruit has been properly simmered, turn up heat to medium-high and cook for 2-3 more minutes to get a little extra color/texture (a tip I learned from Namely Marly!). Then remove from heat. 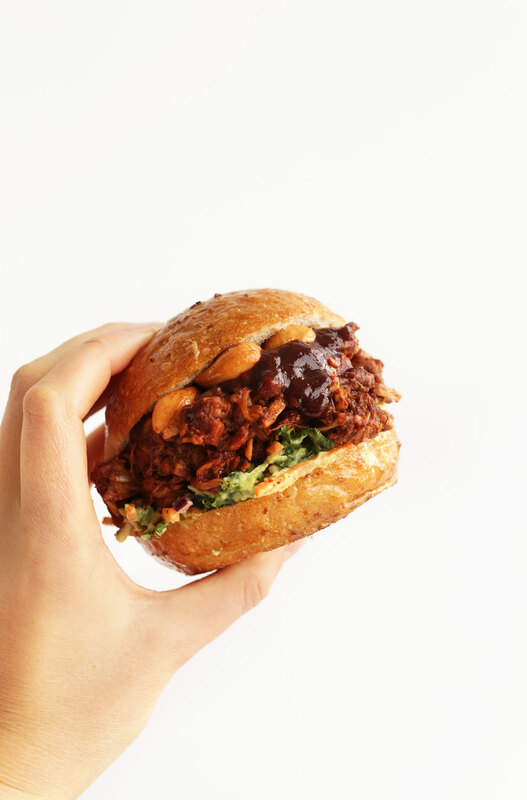 Place generous portions of slaw on the bottom buns, top with generous serving of BBQ jackfruit, and cashews. Serve with extra BBQ sauce! Leftover jackfruit keeps for up to a couple days in the fridge, though best when fresh. *To roast your own cashews: Toss 1/2 cup cashews in a bit of oil and sea salt and spread on a baking sheet. Bake in a 350 degree F oven for 10-12 minutes, or until roasty, fragrant and slightly golden brown. *Nutrition information is a rough estimate calculated with avocado slaw and roasted cashews. *Loosely adapted from Blissful Basil. I bought canned jackfruit in syrup by mistake. (Booo!) And I don’t have time to get the green ones. Can I just soak in water overnight? Hi Jen, if it is young green jackfruit, that should work. But if it is ripe jackfruit, we don’t think it will work for this recipe. Hope that helps! The sodium, carbs and sugar contents are pretty high. Is this because of the BBQ sauce and the bread? Yes, those are both contributors. For less sodium, you could use roasted unsalted cashews. Hope that helps! Fantastic! Even the meat-eaters were satisfied! I had a little leftover jackfruit so put it in a wrap with leftover chopped cabbage, buffalo sauce and a touch of vegan cream cheese. Yum! Will definitely make this one again and again. Hi! My family and extended family loved this! Thank you! I ended up making it in the instant pot as I thought it might sort of deepen the flavor. I sautéed minced Garlic and onion, put in the spiced jackfruit, some bbq sauce and some veggie broth and used the pressure cooker mode for about 3 minutes. We served like bbq tacos. Was a huge hit (even with my picky 11 yo)! I am so thrilled to try this! I love your website and your book. :) All of your recepies are incredible, and have truly helped me in learning how to cook so much! Just curious, are the calories for this recepie 1/5 of the pulled jackfruit and avocado slaw recepie, or just for the jackfruit? Thanks so much! This was delicious!!! So flavourful and easy to make. We like it with extra avocado slices. :) That slaw recipe, in particular, I will be keeping to use with other bbq-tasting recipes as well. Yummmm. 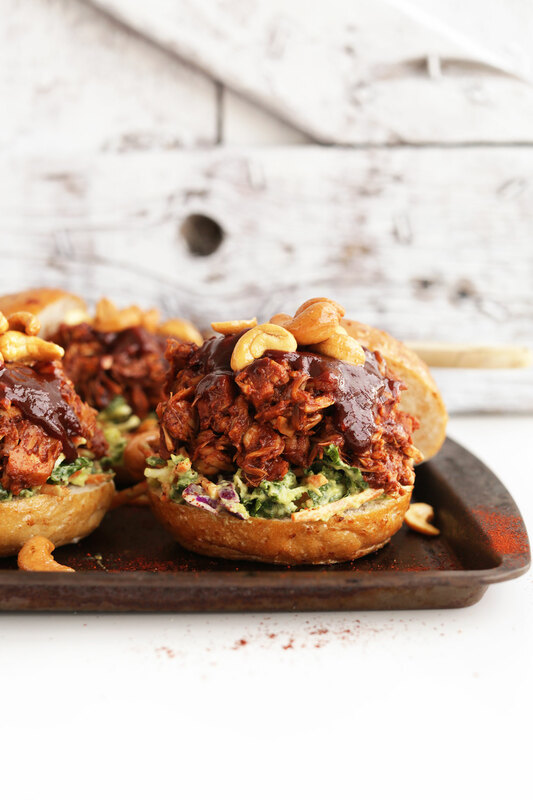 Getting Married in October, and we really want to try a jackfruit bbq (for ourselves as well as our few vegetarian and vegan friends) Your recipe looks amazing, and came highly(and positively) reviewed! I notice that the recipe says this is not really freezer friendly? Could I ask why that is/if you had tried to freeze after prep and if so any suggestions of storage for excess? As well, if anyone who has frozen it found a way to rejuvenate after defrost. Hi Trisska! Congratulations on your upcoming wedding! While we haven’t tried freezing it, others in the comments above have had success in doing so. I think you should probably be okay, but just to be certain, I’d recommend making a small batch well before the big day and then test it in freezer and with how well it does through defrosting. Any ideas on sides for this? I’d recommend serving these with our Crispy Baked Fries, Garlicky Kale Salad, or Garlicky Guac and Plantain Chips! I had tried jackfruit once before and was not a fan. Then my daughter was telling me she had some amazing dishes in London made with it so I decided to give it another try. I’m really glad this was the recipe I found. I made it for a Super Bowl party and even my toughest I’m i critic loved it. The crunch of cashews definitely made it a hit! Thank you. I made this today. It was very tasty in fact I’m about to eat some more. People have said meat eaters have been fooled. I don’t agree but I do like it a lot. Hi Connie! We haven’t tried it that way, but it’s worth a shot! Just make sure you drain off as much liquid as possible. Delicious- a real hit with everyone. We used tinned in brine and just gave it a good rinse! I only have jackfruit in brine, does it make a taste difference it I use that?, I’ve never cooked or eaten jackfruit before. It will affect the flavor, but if you give it a good rinse, you should be fine! I was too much of a chicken to try it so I followed your recipe. I did throw the entire can(s) of jackfruit into a food processor using the dough blade. That shredded the jackfruit so I didn’t have to use a fork. Saved a TON of time. Credit PlantBasedGabriel.com for that trick. Can I make this in the InstaPot? If so, can you give me directions? Hi Carla! We haven’t tried using an InstaPot for this recipe, but if you give it a try, report back on how it goes! Ohh my this looks so yummy! I never heard of jackfruit until I came across this recipe so I did pick up a can of jackfruit. Can’t wait to make this. Thank you for all of your recipes! We hope you love the recipe, Tricia! If you aren’t vegan this recipe might convince you to try it. And if nothings else…TRY THE SLAW!!!! OMG it was perfect. This was my first time trying jackfruit, so I knew I needed to use one of the Minimalist Baker recipes to have a real way of knowing if I liked it or not. I used Trader Joe’s jackfruit in brine and made the seasoning as written. I used whatever BBQ sauce I had in the fridge and cooked exactly as written, although I didn’t measure the BBQ sauce. I made the slaw as written as well, and I know for sure this is the only way I’ll make it from now on. I Served on whole wheat hamburger buns and topped with microgreens and a few dashes of Tapatio. I didn’t do the roasted cashews b/c I was lazy…next time! I really REALLY loved this recipe. I find myself making your recipes every night…Thank you!! I have a bag of frozen jackfruit (Whole Foods, maybe?). It’s yellow and sweet. I’m not that familiar with it. Do you think this might be ok to use? Thanks!! Hi Channing! We haven’t tried it that way, but it’s worth a shot! Just make sure you drain off as much liquid as possible. I want to make this for a couple of vegan friends attending a pre-wedding picnic. Can it be frozen? I won’t have time to make it the day before or day of. We wouldn’t recommend freezing this recipe, Becky! It does last a couple of days though if that helps! Well, I made it yesterday and it’s in the freezer! I’ll report back to tell you how it fares! I’m thinking it might turn out a little mushy, but it was worth trying. I make batches for the freezer and it is fine when reheated! And I used the whole can 3 really, but I did not take off the firmer core like point, but just chopped it smaller and it was fine. I liked the chunkier texture. I am not a vegetarian, but I challenge you fellow meat eaters to try this dish. You will love it. My daughter-in-law made it while I was in Cali., and I thought it was pork bbq, until she told me it was not. I bought a case from our local Trader Joe’s. I guess I’ll be eating this for a while! I made this as tacos! It was fantastic! Maybe give a little more info about removing core and seeds, I had to look up further instruction. But it’s a great recipe! The cashews are a great call. Just made this, but added diced onions to the pan, before the jack fruit. Pretty excited to eat this tomorrow for lunch with a lime mayo. RIP to the days when fake meat was flavoured wheat in various shapes. Long live the jack fruit! Long live the jackfruit indeed! We hope you love the recipe! This recipe was phenomenal! We ended up using a fresh jackfruit, making up the amounts of the ingredients, and using corn chips instead of bread to eat it with. Either way this is something that every meat eater should try. This made going vegan much easier. Glad to hear you enjoyed it, Kevon! If you could share how you did it with fresh jackfruit, that would be amazing. I’ve found it really stinky and awful to work with! PLEASE share! We got an unripe jackfruit which is what I’ve also read as far as the ‘meat’ being good for these recipes. It was definitely sticky as the latex seeped out, but the alternative is using oil to lube the blade and your hands to keep them from sticking. I found this to be quiet dangerous after doing it a few times so I’ve kept to only lubing the blade and using a coating of oil afterward on my hands before doing a soap rinse. If you get a ripe jackfruit the fruit part is AMAZING, but the ‘meat’ is a little too tender to be used as a substitute. That helps a lot, thanks so much!! Mano Mano, this is tasty. Im new to Jackfruit after having it on a salad at a restaurant I went looking for recipes and stumbled on yours. Love the flavor! I used smoked paprika and chipolte chili pepper to the spice mix. And some smoked paprika to the slaw. I am now officially a jackfruit nut. Thanks for the recipe! So excited to finally get around to trying jackfruit! I got mine from a local asian market (in brine). Followed the recipe pretty much to a “T”, except added some smoked paprika for smokiness and I served it in corn tortillas rather than buns. For the BBQ sauce I used the “Zippy Barbecue Sauce” from AllRecipes. Will definitely make again! Thanks for the great recipe! We’re so glad you enjoyed it, Jade! Happy 4th! Excellent recipe!! I went to a BBQ recently and made this so I would have something to eat and enough to share. Not only did the meat eaters thank me for making ‘pulled pork’ they raved about it…only to find out it was jack fruit. Lol!! Will be making this again! Thanks for sharing. i am so jazzed that you can buy canned jackfruit at trader joe’s now! i’m not from the south and didnt grow up eating bbq, so i picked out a BBQ sauce the best i could. moving forward, i think i need to figure out which qualities i like in a bbq sauce and choose a different type of sauce. i added mild green chiles and some mustard powder to this recipe. i changed up the slaw and made a kale/carrot/sunflower seed situation and it was supes yummy. both of our faces were covered in sauce at the end of dinner… the recipe is great!! This looks so good! I’m trying not to do any added sugar. Any thoughts on modifying the sauce to be low or no sugar? Thank you! Hi Sarah! While I would highly recommend keeping at least some of the sugar content in this recipe, you could get away with cutting it down to half if preferred that way. Good luck! Accidentally substituted young jackfruit for fresh, fully ripened jackfruit, which resulted in a mixture that was way too sweet! Will definitely try this recipe again with young jackfruit. I’ve had two cans of Trader Joe’s jackfruit (in brine) sitting in my cabinet for months. I’ve read about using it as a meat substitute (pulled pork specifically) but have been very wary about trying it. Last night I decided to put my big girl apron on and give it a go! And, I must say, it didn’t disappoint….me. My husband gave it a try and he didn’t feel the same way. I’ve not had meat (with the exception of seafood in months) and I think it makes easier to trick my palate. Anywho, I rinsed the canned jackfruit (since it was in brine) and omitted salt from the recipe. I used the leftover “meat” for a bbq flatbread for lunch. It reheats very well! Will make again! Yay! Glad you loved it, Amber! I’ve used TJ’s jackfruit in brine a few times for this recipe, and just a quick rinse does the trick. I’ve never thought it tasted too salty. Great recipe! This was a fantastic recipe, I made it for my daughters outdoor engagement party which was also a Kentucky Derby party. I made Kentucky Bourbon BBQ Sauce which you can find on Allrecipes.com. Served with the Slaw, even meatlovers like me enjoyed it. I will definitely make it again. Hello! I made this once before and it was delish! I’m planning to make it again this week, but I had some confusion about the core of the jackfruit – whic part is the core and how much do I cut off? Looking at pictures from google it was hard to tell, and I wasn’t sure if the canned jackfruit I bought already had it cut off or not. Any sort of reference picture would be really appreciated! Hi Willow! You’ll just want to cut the core of the jackfruit, which will be the tougher part of the fruit and is going to be one of the corners of each piece. Hope this helps! We’re glad you and your family enjoyed the jackfruit, Nancy! Will be making this for an outdoor event May 5th, do I peel the Jackfruit, cut in half to remove the core. Hi Ian! No need to peel, just simply chop off the center “core” portion of the fruit and discard. The jackfruit comes pre-cut in the can. Hope this helps! Thank you will be making homemade Kentucky Bourbon BBQ sauce to use in this. I will let you know how it turns out. What happens if I only have canned jackfruit in brine? How do i modify? Hi Danielle! You could try and soak it in water overnight to get out the brininess flavor! Let us know if you give it a try. Ok, I just made this and it was amazing! I cut out the brown sugar for coconut sugar and only added half. I prepared my jackfruit https://www.youtube.com/watch?v=GSb-TZ92HQE (much better tasting) I can’t wait to make this for my carnivore friends. It’s a definite keeper! Thanks for sharing your changes, Theresa! There are a dozen ads on this page, and the page kept reloading until it crashed. Thus, I couldn’t keep it open on my ipad while cooking. When I needed to refer back to it, I had to reload the page, which didn’t work because it crashes while loading, then go back to google and search to load it… for a while until it crashed again. You really don’t need a dozen ads on the page that keep reloading. Hi Richard! Thanks for reaching out. I will pass along your feedback as this would be quite a frustrating experience when trying to follow a recipe and we will see what we can do. Just want to add I have the same frustration. I ended up having to take a screen grab and just go off the photo. It’s really an issue that could use attention as I otherwise love the content on this site. Hi Laura! Thanks for reaching out and sorry to hear you’re having trouble with the site. What device are you viewing it from/what internet browser? If you let us know, we’ll do our best to figure out whats causing that! Hi! Thanks for the reply. I’m using Chrome on PC and Safari on iPhone. I live in China and Jack fruit is available year round here, but I’ve never seen green unripe Jack fruit in cans like you use for this recipe. So I tried using fresh ripe Jack fruit… And actually it wasn’t bad. Used garlic and Chinese BBQ spice and I enjoyed it. Albeit the texture AND taste was more like savoury fried banana than pulled pork (from what I remember- 13 years since my last pork meal!) . So I think I’ll try get my hands on some tinned green jackfruit. Love your blog! keep up the good work (and yes I’m a teacher haha) ! Thank you for the awesome recipe. I made a similar recipe with brined jackfruit from Trader Joe’s .As I did not have any previous experience with jackfruit I just rinsed it and lightly dried it and carried on with the recipe. I was disappointed. My mix had a strong vinegar taste and little hunks of the core which do not shread were tough and unchewable. After reading all of the posts I will try again and soak the The jackfruit to try to get the brine out and cut the pieces of core out before cooking. Thanks! I made this last night and HOLY HECK. It’s is so good, and tastes IDENTICAL to pulled pork. Wow wow wow! Another hit! Love this stuff. It’s flavor is so mild and texture so meaty I could imagine all kinds of other applications for it. My husband cooked n shredded some down and tossed it with some vegan mayo to make a “lobster” roll. That was delicious too! This recipe is awesome! I only had jackfruit in brine and it still tasted great. Definitely worth the time to break up the fruit to get the right texture. Thanks so much!! This is the best recipe I have made since becoming vegan, maybe even ever! Me and my boyfriend couldn’t bear to save the rest of it for later and ended up eating it all in one go! Any one with a mouth will enjoy this recipe! Will 100% be dreaming of this before I make it again. Hi Betty! We haven’t tried it, but I will add it to the list of things to test! I also added vegan mayo to the coleslaw and omitted the maple syrup, which worked great too! So I was only able to get jackfruit in brine, do you know if it can be rinsed or soaked or something? We’ve been dying to try out this recipe so I’m hoping you might know. Hi! You can use it, just make sure to rinse it well! This was THE BEST sandwich I’ve had in a long time! I was never a fan of pork so I’ve never had a pulled pork sandwich, but I can guarantee that this sandwich is ten times better . I LIVE by this blog, I literally cook Dana’s recipes every week, I’ve tried so many and all of them have come out tasting delicious. My (non-vegan) boyfriend loves all of them. Thank you!! I have never used jackfruit before but have a few cans in brine I need to use. I noticed the NOT in brine, but what would the brine do to the recipe? Could I make it work or should I save them for something else? Hi! Just make sure to rinse it well and you can use it! This is so good! Taste just like pork! Kids even liked it ! Another delicious recipe from this website! Thank you ! First of all….What??? This is so confusing!! 1) Jackfruit is the WEIRDEST thing I’ve ever cooked with, its ugly, it doesn’t really smell all that good and it has those odd “bean” things in it. 2) This recipe is delicious! I did not make a sandwich, but had it with smashed red potatoes and coleslaw, I loved it! I will use this recipe as the base of so many others! Thank you!! I had to take my daughter to the Dr. yesterday so I asked my husband to make dinner last night. He made this recipe and I JUST LOVED IT! Will definitely save this recipe. Will be a go-to for BBQ in the future! I just loved it. Thank you. Is there a mofdification for if we have the canned jackfruit that IS in brine? Hi Laura! It’s not ideal, but if you rinse it more it will be fine! Looks great! I will try it tomorrow. Why do you use garlic powder instead of garlic? Does it serve some technical purpose? I banned garlic powder (and onion powder and ginger powder) from my kitchen because it smells and tastes … strange. Hi Ira! We just prefer to use garlic powder, you can use cloves of garlic if you would like. 1 clove equals 1/3 teaspoon of garlic powder. Hope this helps! Thanks for answering. Are there any recipes where you prefere cloves? If so: why? Amazing!! We made it without the cashews. My husband and 7 year old LOVED IT!! Definitely going into the “favorites” binder! Thank you!! Can this be made with fresh jackfruit instead of canned? Hi Brianna! I wish we had the answer there! My only guess is that you would want to buy a young, underripe jackfruit and split it open. Then try and follow my instructions as noted! I have read majority of the reviews. Yes it looks good but has anyone made this recipe? That’s why I read reviews to get tips and opinions on how they prepared the dish and what it tastes like. Unfortunately the reviews were not helpful. I’ve made this about a week ago and it is absolutely delicious! Also, very easy and fast. It took me about 30 min and just one bowl and one pan! I highly recommend it! This was so delicious! My entire family said they thought it was pulled pork. The dish was spicy (I made the BBQ seasoning and used Trader Joe’s BBQ sauce) for some people in the family but I loved the heat. I also used Trader Joe’s jackfruit in brine and it turned out fine! I rinsed the jackfruit very well and soaked it in water for 5 minutes. Fantastic recipe, thanks!! Oops thought I rated it in the first comment! My mother and I have recently transitioned to a plant-based vegan lifestyle and we, being from Oklahoma and Texas, really wanted to find a vegan BBQ alternative. This recipe was absolutely DELICIOUS! It is exactly like eating real BBQ and the avocado coleslaw was also insanely yummy. We fed these sandwiches to our non-vegan family members and they loved it too! I will absolutely be making this recipe again (and again, and again, and again)! I’m so excited to try this tonight, pairing with some nice sweet potato fries but does this recipe really only make one sandwich? Can I add more jackfruit? Hi! It makes 4-5 sandwiches! Winner winner jackfruit dinner! It was everything I hoped it would be. Cashews? Yep! Brilliant! I doubled up on the slaw for leftovers. Might just eat it for breakfast. A light pulsing in the food processor cut time on the jackfruit prep and I was happy with the texture. When the family wants BBQ, this is what I’ll feed them. Thanks for another great recipe. They have consistently made plant-based eating a joyful adventure. Glad you loved it, Rob! Unfortunately this was not a win. It didn’t taste like BBQ pulled pork at all. It was super sweet and took awhile to pull apart. Bummed it didn’t work out. I don’t normally review recipes but this was unreal! Been trying to go vegan but am a sucker for a BBQ, this is on of the best recipes I’ve tried including real meat. 10/10 thankyou! If you’re struggling to find jackfruit in water, i managed with in brine I just rinsed well before, dried it and didn’t add the salt into the BBQ seasoning mix and came out great. Excellent introduction into cooking jackfruit at home. The first time I came across this fruit, I was in Indonesia in 2015 and took a bit of what I thought was chicken at a pedant style restaurant — turns out it was vegetarian (to my delight) and fruit (to my surprise). Ever since i’ve been sort of enthralled by it, thinking I had to head back east to indulge again. In sum, i’m super glad to see jackfruit selling in the states. I made this recipe for dinner today and it was delicious — honestly tasted like a BBQ pulled pork sandwich and my boyfriend agreed. Definitely a repeat recipe. I swapped the slaw for plain old mashed avocado and smushed the BBQ jackfruit + avo between a toasted whole wheat english muffin. Twas perfect. No way this recipe has 11.5 grams of protein. How did you figure this out? Hi! Thanks for this recepie, i havnt tried it yet but im on my way. Just got back from the supermarket and realised i have bought the wrong type of jack fruit ( in syrup). Can i use this, and whats the difference? Hi! You can but the flavor will be a little different! See comments above. Jackfruit in syrup is ripened fruit. They are yellow in color and look like little pods. The ripe fruit tastes more like a very sweet combo of banana, mango, and Juicy fruit gum. Jackfruit in brine or water is young and green, before the sweet yellow pods develop, which are best for meat substitutes. If using fresh jackfruit, you need to purchase a very green one, which is hard to find in grocery stores. Most of the time, they are already ripe, which you can tell by the brown spots on the skin of the fruit. Fresh jackfruit also leeches a thick and sticky rubber like substance when you cut into it, so it can be a cumbersome task. I made this tonight and I LOVED it! My husband who is a meat eater said he liked it better than regular pulled pork. He liked the texture of the jackfruit. I added some to the coleslaw and pickles to the bun, but that’s just because I love both of those things in any sandwich. :) Thank you! I have never purchased BBQ sauce – is there a particular brand you would recommend? Something more spicy then sweet. I used Annie’s Organic BBQ Sauce. It was not as sweet as others and I added a pinch of cayenne to spice it up. Just made this (minus the cashews but added a splash of cayenne to the fruit) recipe to a t and… OMG. Soooooo good! My carnivorous son was not really hungry and only tried it after much guilt laying on my part. He couldn’t get over how seriously delicious it is and he ate it all!! The mixture of the cool slaw and the delicious “pork”. Wow. Just Wow! Thank you! Hey… where do I post a pic of it? Hi Moira! Share your photos on Instagram and use the hashtag #MinimalistBaker so we can see! Happy Cooking! Great recipe! One thing though… no cashews! I’d rather eat a handful of cashews for protein prior to making the sandwich so it’s not completely ruined. The flavor and texture of cashews have no business being on a BBQ pulled pork/jackfruit style sandwiches . Lastly, avocado slaw is great! I’ve seen fresh jackfruit sold in farmer’s markets and was wondering if you have a recipe for a curried jackfruit. I’d love to cook it fresh. Hope you can make this recipe as I’ll be waiting with baited breath to see what you come up with. Also, I know fresh Jackfruit is pretty sticky so some oil on the knife would help. Hi Vanessa! We don’t yet, but I’ll be sure to add it to our recipe request list! I was very curious about trying this …..so I did.Made it with a quarter size of fresh Jackfruit. Let me tell you, this fruit tastes just like Wrigleys Juicy fruits…..I had to stop myself from eating it all. On the other hand I was disappointed with the result of the recipe. Followed it to a t with no alterations. Just wasted my yummy fruit…oh well! This recipe calls for young unripened jackfruit which is typically used for meat substitutes. Fresh ripened jackfruit is wonderful on it’s own. I’ve never eaten bbq pulled pork or chicken or anything similar and this was fabulous. Hubs and kiddo loved it. I will definitely make it again. I did caramelize onions first and add it to the fruit. Thank you! There is a place here in SLC that makes these on sourdough. They do slaw and guacamole, and add blackbeans to the jackfruit. They are so WONDERFUL! I’m going to try this recipe next time so that I don’t have to drive for an hour, eat outside in the heat AND pay $7.00/sandwich. (I have 4 kids, so that adds up!) Thanks for posting this recipe! We love your food! I tried this recipe last night. It was delicious!!! I had a BBQ jackfruit sandwich at a restaurant about a week ago and this recipe was WAY BETTER. The BBQ spice mix adds a ton of flavor and the tip to remove the core of the fruit helps for the fruit to break into smaller pieces which improve the texture and taste of the dish. My Dad had eaten Jackfruit in the Philippines years ago, and said it was slimy and did not enjoy, but this recipe changed his mind about the fruit. He loved the sandwich and had seconds. Thank you for this easy and delicious summer recipe! I will definitely make it again. I want to make this at my son’s birthday party. Would it be okay to put it in a crockpot after I cook it? Or do you have any suggestions for keeping it warm/serving in large amount for a party? Hi Shelby! Yes, crockpot on low should keep it warm for your party! Alright listen, can we not go around disparaging the food of other cultures by calling it a “giant green eyesore” or “ugly and weird” before you go and turn it to something you feel safe eating? I enjoy vegan food but I have had it up to here with vegans going to Asian countries like my own and insulting the food there right before taking it home and eating it. I grew up eating jackfruit straight from the can, and fresh when available. When I’m in my parents’ country, I try to at as much of it as I can because it’s delicious as is wen ripe. It’s not cute or charming to insult the fruits many Asian families eat regularly. It’s disgusting and offensive. WOW. This is amazing! A big favorite from my “vegan at home” fiancé (aka he eats whatever I cook -ha!). I have been wanting to try this but never went to the specialty store to get jackfruit. This week I saw canned jackfruit at my local Trader Joe’s and was SO excited! It is in brine – but it actually still worked really well and tasted delicious. 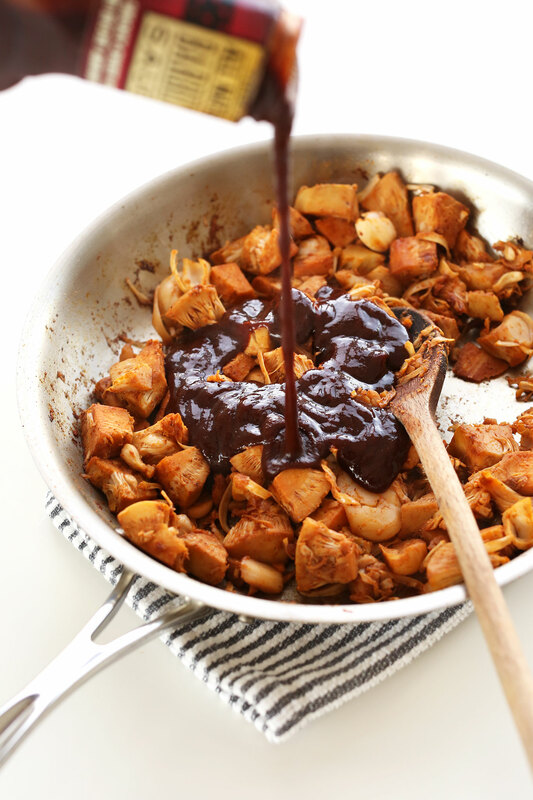 Also added red onions to the jackfruit pan… SO good! Can’t wait to make this again already – thanks Dana! Question, can the brown sugar be substituted for coconut sugar? Yes I think that would work, Kait! Substitute it at a 1:1 ratio. The prep time for this took WAY longer than expected. If you’re anything like me and texture is a big deal, be sure you get all the seeds and tough parts out prior to cooking. This almost mimics meat a bit too much… biting into something “gristley” isn’t appetizing, even when it’s fruit. It also does not serve 4-5. We aren’t big eaters at all and this only made 3 sandwiches. Taste was amazing though and really hit the spot with coleslaw and corn on the cob! I was so excited to find tins of jackfruit at a market today I scooped some up to take home and make this, only to reread the recipe and find out i had bought jackfruit in brine!!! That’s all that’s on offer here. I’m a bit gutted as i was so looking forward to making this! Am I totally screwed or is it salvageable?!? Thanks ? Hi Lauren! Oh no! I don’t know what to do with the syrup kind, sorry. I don’t think it works but if you do try it, I’d suggest rinsing and rinsing it some more! Good luck! This recipe never fails. I have made this 3 times and this past weekend I made it again and it reminded me how good and easy it is. I did sauté chopped onions in olive oil first and then added the jackfruit in w/ bbq sauce (I used Annies). We put this on a gluten free baguette and delicious! My hubbie loves it too and says this recipe is “genius”. I made these this morning. So easy and so yummy! I had a loaf of bread from Cafe Europa in Kansas City and put the BBQ jackfruit on the bread. I even gave some to a meat-eating friend and he LOVED it! Will have to try with cashews etc. Thanks so much! Have you ever made it with fresh jackfruit? Seems like it may be a lot of work. I bought canned JF at Pan Asia market. I haven’t tried making it with fresh jackfruit but definitely recommend the canned stuff! This is so good. My meat eating family was shocked it was vegan. I now can have BBQ again! This is great. 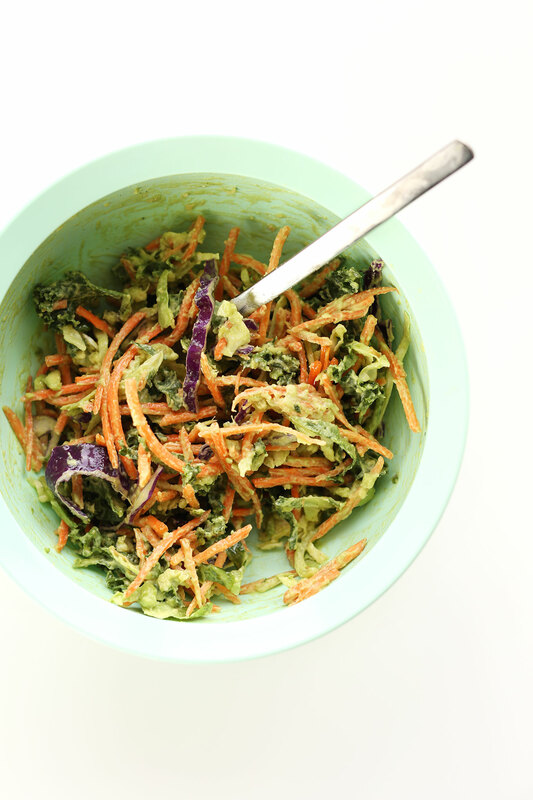 Normal eaters will also love this with some cheese grated on top and a bit of mayo in the slaw….yum. Perfect for non pork eating religions! I know right?! Glad you enjoyed it! Will this recipe work with a fresh jackfruit? If so do you have advice on how to use it in this recipe? I bought the jackfruit in a can and am waiting for it to arrive. In the meantime I spotted dried jackfruit at the market. Have you ever tried soaking dried jackfruit? Hmm,I haven’t! But if you try it let me know! It may work. Is there any way that young green jack fruit in brine can be utilized for this recipe? Yeah, I think you can just rinse it really thoroughly! P.S. – It sounds like your taste in food is as superior as your taste in living quarters; I hope to relocate to Oregon myself! I just love the way your recipies are so innovative. 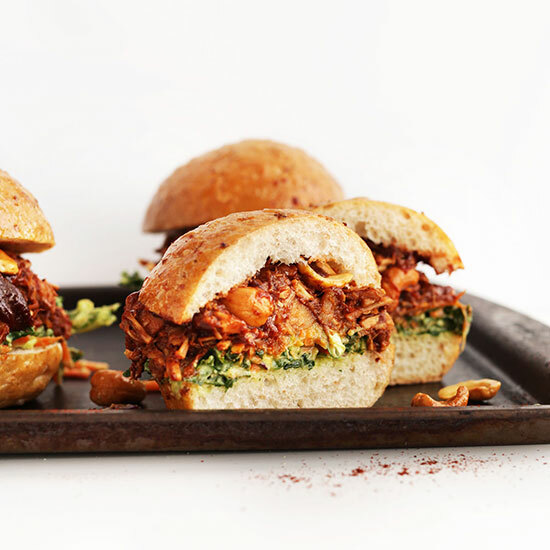 BBQ jackfruit sandwiches sound delicious. Looking forward to trying this soon. Thank you so much, this recipe is absolutely awesome! Made it tonight & made my own bbq sauce to go with it. I’m pretty new to the kitchen & the look of delight on my wife’s face when I served it up was priceless. The avo slaw is fantastic too. Will be checking out more stuff on your site for sure. 5 stars. I recently have acquired some jackfruit for this recipe, but I did not realize it needed to be in water and not brine. Can I still make this recipe work? I love every vegan recipe I’ve tried from your website! I couldn’t find jackfruit without syrup in a can, do you think I can try to soak it in water first to remove the syrup or something like that so that I can have a similar result? We can’t guarantee the results but I think you could try this Kim! I know other readers had success with rinsing jackfruit that came in a brine, though, the syrup might be more tricky. Let us know how it turns out! The stuff in syrup is ripe jackfruit, which actually tastes like fruit. It’s only good for desserts. The jackfruit in water or brine is unripe, and doesn’t have any flavour, which is what makes it good for absorbing other flavours. Hi! Can I make this with jackfruit straight from the fruit itself?? I just bought a real one, not a can. Could I use frozen jackfruit? It’s all I can find…. I haven’t tried it that way, but it’s worth a shot! Just make sure you drain off as much liquid as possible. All I could find was jackfruit in syrup so I gave it a go anyway despite your warning haha. As you said, the texture is not quite right but its still delicious so don’t be afriad to give it a go if that’s all you have access to. I just drained it and rinsed it thoroughly and used less bbq sauce, a drop of liquid smoke and a few dashes of chipotle. Mmmm would be perfect in a taco! I might try adding shredded or minced seitan next time to see if I can inprove the texture. But so yum!!!! Oh no, I thought I finally had all the ingredients for this but now realise te can I have is in BRINE my water. Will this matter? I made these sliders today (without the added cashews and my own slaw) and they were amazing! This is definitely going to be a recurring dinner at my house. Thank you so much for sharing! I’m trying this as we speak, but I’m smoking the Jackfruit on my pellet grill first! I’ve been wanting to try this forever, I finally did today, it was AMAZING! Thank you for giving me a non tofu vegan alternative to pulled pork, it even got a few thumbs up from the carnivores!! I am trying to find jackfruit packed in only water but am having a difficult time. The markets I have been to either have the ones packed in brine or syrup, but none just packed in water. And the one on Amazon that says “packed in water”, in reality, when you read the ingredients, includes salt and a preservative. What brand do you use or suggest? Salt and preservative is fine! Brine is fine, too. Ideally it’s just water but if there’s brine just rinse well! Hi- I am planning to make this recipe- it looks great. But when I find jackfruit in water, there’s also salt- is that then brine? I haven’t found any young green jackfruit in just plain water. Does the jackfruit you use have some salt in it? What brand do you use? Thanks so much! The brine will work! Just give it a good rinse before. I don’t remember the brand I got, it was from an Asian market! Thanks so much! I used the jackfruit in water and salt and it was delicious. My husband loved it! I ended up squeezing some of the water from the fruit in addition to draining and drying it. I also made your strawberry rhubarb crumble which was so good. But I found at room temperature the crumble fell apart unless I refrigerated it. Any advice for this? I plan to make it again for the 4th of July! Can this be done overnight overnight in a slow cooker? I’ve heard people doing that, but I haven’t tried it myself. If you give it a try, let me know how it goes! I made this recipe today and it was delicious! I couldn’t find the jackfruit in water so I used the one in brine. I let it soak in water for a couple of hours, rinsed it and squeezed the excess water with a napkin. I couldn’t taste the brine flavor after cooking it! I also did the cole slaw, I used purple cabbage, grated carrots and kale. Will defiantly be making it again! Forgot to mention, I added mushrooms and onion to the jackfruit just for extra texture ? Another great recipe and thank you for introducing me to jackfruit. Tasted superb, great texture and a couple of meat eaters arrived as I was getting stuck in, tried it and were wide eyed with wonder at how good it was. Mine came out pretty hot but I failed to take into account the scotch bonnet chillies in the BBQ sauce I used and added a grind of chillies to the pan! The only thing I would say is don’t discard the little triangles of core from the jackfruit. They can be used in other recipes, they just hang together more than the stringy ‘pulled pork’ flesh of the fruit. This was my first jackfruit. I have to say, I picked the right recipe to try first! Yum! I made this last night and just finished off the leftovers for lunch. This meal is absolutely delicious! I’m going to make a giant batch for an upcoming barbecue to wow my veg-skeptical friends! I bought th can of green jackfruit before reading a few recipes but it was in brine not water. if I rinse it well will it work alright instead of the jackfruit in water? Thanks. I can’t wait to try this recipe:)! This is essentially a carb bomb. Way too much sugar and extremely high on the glycemic index. If you’re body is still pumping loads of sugar for energy, you’re doing it wrong. Just made this for dinner tonight :) I had to add quite a bit of water to thin and reduce the spiciness of the jackfruit. In the end, it turned out super delicious!! I served them with some baked sweet potato fries. My family absolutely loved this meal. They didn’t even realize that it wasn’t meat! I will definitely be making this again, thank you for the recipe! Can any portions of this meal be made the day before? I want to make it all for a party. I had some of the jackfruit left over in the pan from the day before. Reheated it and it was fine. The salad would be better made fresh though. Made this last night with my bf, seriously incredible. I still can’t get over it! Thanks for the recipe, will definitely be making this again! This recipe is fantastic!! It’s hard to find a winning dinner in my house! My two boys that are 10 and 12 have requested for me to put this into our weekly rotation. Since I have celiac I have mine in lettuce wraps but everyone else eats it on Hawaiian sweet buns. Thank you for your fabulous recipies! I just watched a video by the “vegan black metal chef” who suggests boiling the jackfruit in a couple of changes of water for about an hour to get rid of some of the unique jackfruit taste before adding the barbeque sauce. I personally enjoy the different taste but BBQ purists (you know who you are) might be turned off by it. Looking forward to making this and the slaw tonight (and possibly ruining everything)! I’ve made a lot of your recipes with great success, but i’ve managed to foul up a few which you can read in my blog post (linked below). ok my first attempt after finally getting my can out of the pantry and going for it! so easy but i am wondering, how long does it stay fresh after marinating and cooking it. any ideas? how do you tell if it has gone bad after you prepare it? i like to prep things in batches and then have on hand to warm in a pinch. thanks so much!! Just made this tonight!! My hubby & I loved it :) Thank you so much! Does it matter if it young jack fruit or adult? I re-read the post and found my answer! Can’t wait to try. I ordered my YOUNG jackfruit from Amazon. Thank you for your always great recipes and for being a reliable source on my plant-based journey! I made this recipe and it’s wonderful! The flavor combinations are outstanding! I made a few modifications….I sauteed up a diced onions before adding the jack fruit into the pan, I added one teaspoon of cumin and half teaspoon of cayenne pepper into the bbq rub. This recipe is the best dish we’ve had since becoming vegan. Even our non-vegan friends loved it! Well worth the effort. I loved the bbq jackfruit sandwich. I have never had jackfruit before and didn’t think I could make it, especially make it so good. My daughter who still eats meat even loved it. Looking forward to try more recipes. This is an amazing recipe. My husband and I had it for dinner tonight, and although he is the carnivore of the family, he thought it was delicious! Just as a side note…I did not see a step that says to cover with a lid even though step 5 says to “remove lid and stir occasionally.” Could you possibly add that to step 4 for those of us who don’t read the entire instruction list before cooking? Again, amazing recipe and thanks for your hard work and diligence to bring us all delicious, healthy, and hearty food! Hi! This recipe looks delicious! 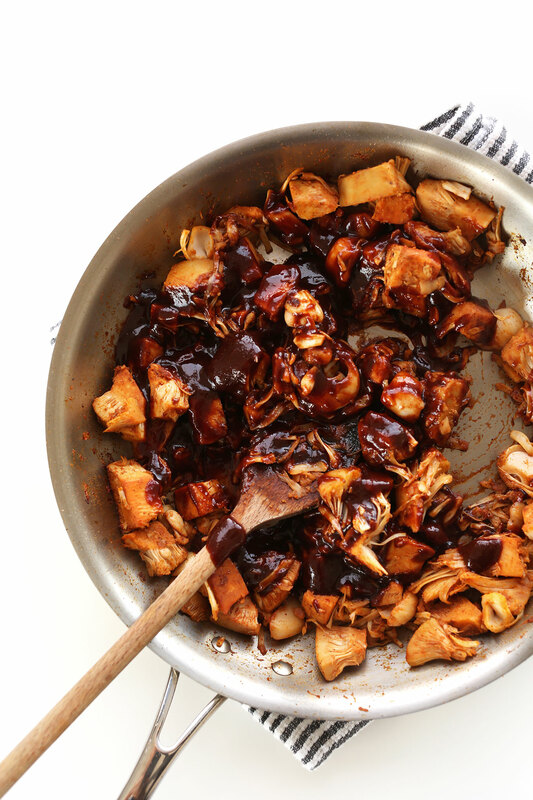 What barbecue sauce did you use and where did you find the cans of jackfruit? I cannot find them in any of my local grocery stores. Thanks! Hi Dana! Just wondering where I can find jack fruit? I’m in Canada and I’ve checked all of my go to vegan stores (goodness me!, horn of plenty..) and they don’t carry it!! :( Dying to try this recipe! I’m in Vancouver BC where Superstore and T&T both carry jackfruit in brine. Perhaps try those two? Dana, thank you for this recipe. I’ve made it several times already in the past few months. My partner gets extremely excited when he knows it’s for dinner. We both love it with the cool slaw and homemade buns. Your recipes are delicious; your food photography is mouth-watering; and the clean look of your blog is appealing. Thank you for all the hard work you do. Ah, thanks! That’s a great tip. So glad you both enjoy this recipe so much. xo! Rebecca, it sounds like you’re from the same area as me. There’s a small Caribbean store in the same plaza as Goodness Me on Upper Gage that carries cans of the young jackfruit in water. They’re a green can and pretty inexpensive. I just bought some yesterday and I’m looking forward to trying the recipe! Superstore in the Asian food isle. There are lots of Asian markets in downtown Hamilton if that’s where you’re looking. I haven’t checked for them yet, but that’s where I would start! B&T would be my first choice. There’s one on Cannon and one on Queen St.
I’d try soaking it in water, yes. But I haven’t tried this myself and can’t guarantee the results. Best of luck! My roommate made this for me because she knows how much I miss pulled pork sandwiches. Let me tell you. I almost started crying it is so good. Making it for my meat-loving parents tonight. Can’t wait for the look on their face!!! Ha! So great! Thanks for sharing, Laura! Do the nutritional facts here include the bun? Such an incredible sandwich. Thank you so much! I believe so, yes! So glad you liked it, Meg! My first attempt at this was aborted when I discovered the jackfruit was full of seeds. As you made no mention of seeds, was I just meant to ignore them? I usually remove any parts that don’t ‘shred’ well, including the seeds. But that’s just me being picky. It’s totally preference as in the final product, it’s mostly undetectable. Thanks for the recipe! I had this on my list for a while and was full of anticipation by the time I was finally able to get some jackfruit and try it out. So it was very exciting to have this turn out as delicious as I had hoped! Hey there the only canned Jack fruit I can find where I live is in syrup. Any recommendations for using it for this recipe? I figure rinse it with water maybe even soak it and rinse and resoak and rinse, etc. Ideas? I don’t know what to do with the syrup kind, sorry. I don’t think it works! Hi, so the taste was awesome but the jackfruit cooked into a gluggy mess. Any thoughts? Note, I used fresh jackfruit. Hmm, perhaps leave the lid off because it got too liquidy? This dish is AMAH-ZING. I am not one to care so much about replicating the texture and flavor of meat. Whether or not this one does a good job, I am going back for thirds. Double thumbs-up. Jackfruit for the win. I think I want to try using jackfruit to make “crab” cakes next. Yay! Thanks for sharing, Sophie! Good luck on the “crab” experiment! I just drove an hour away to an Asian market. I thought I hit a score and bought 4 cans of jackfruit….but it’s in brine (sad face) why would this not work? Also it’s green jack fruit it doesn’t say anything about young. What have I done will this work? I’ve been looking forward to trying this. I did it today…and I was disappointed. I’ve reached the conclusion that being a vegan is best served by cooking totally differently rather than trying to replace favourite foods. I’m going to eat it tomorrow with nachos and some non-dairy cheese (hypocritical given my comment above, but i think this needs it). The texture, whilst initially similar to pulled pork, quickly becomes mush. I was gutted to be fair as I was hoping for something special. This is a nail in the coffin for me in terms of attempting to replicate old favourites (bbq tempeh was also a letdown), apart from possibly a vegan mayo. I’m probably setting myself up for another fall there though. All that aside, I love your blog. Great stuff. A vegan chef I know insists that a final step is to dry it out for a 10-15ish minutes in the oven to get the right texture. I assume this would fix the “mush” you speak of. Don’t give up if the taste was right. What a wonderful recipe! I went to my local Asian market, and while I was able to find the jackfruit in water, it had some strange preservative in it, so I opted for the jackfruit in brine (jackfruit, salt, water…all things I can pronounce!). Followed the recipe as is with some Stubbs BBQ sauce and it was phenomenal. The texture was just a little softer than pulled pork would be, but I and my omnivore pals loved it! I made a mayo based red cabbage and jicama slaw to top it and also added the salted roasted cashew (added wonderful texture!) I made some sriracha lime corn tortillas instead of the bun, and these were some of the best veg tacos I’ve ever had. The leftovers are turning into BBQ nachos tomorrow! This recipe inspired me to try some mojo style pulled “chicken” next with the jackfruit. Thanks!! Too good! I’m a vegetarian living with 4 heavy meat-eating males… and they were fooled! One of the lads saw the jackfruit in the bbq seasoning and asked if it was chicken, told him it was pork then dinner time came along and he kept talking about how good his bbq “pork” was. Thanks so much for sharing this! My husband makes some amazing pulled pork in the smoker (so good I used to be disappointed by every pulled pork I had at a BBQ place) and I was pretty sad to say goodbye to it when I decided to eat vegan. This just saved me! We had it for dinner and I thought it was every bit as good as his! He approved too :). The cashews and slaw were a really nice touch, too. So great! Thanks for sharing, Mindy! Glad you liked it. -after some research on other jackfruit recipes, I used jackfruit in brine as I didn’t want to run all around town looking for jackfruit in water. I rinsed the fruit, squeezed the liquid from it with my hands, and then rinsed it again. -I separated the stringy parts from the core, and then chopped the core in to small pieces. The core isn’t really that tough, and I didn’t really notice it in the final product. -The brine flavor was a little present, but it was almost vinegary, so I think adding some apple cider vinegar to the bbq sauce would help cover up the brineyness. -the texture was so spot on for pulled pork! I couldn’t believe it. Oh great! Thanks for the tips, Jackie! Why not brine? It is just salty water? Do frozen (yellow) pieces of jackfruit work for this recipe? if you eat meat, could you use chicken or pork instead of jackfruit? Yes! See other commenters’ experiences. But I would recommend draining, soaking in water and thoroughly rinsing to remove any of the acidic flavor. Then draining and proceeding as instructed! I actually posted my question THEN read previous comments! Doh! Thanks, ill be making it tomorrow and i will let you know how i went! Thanks for the speedy reply! I am SO excited to try this recipe! We are regulars at FUD (the Tex-Mex Ckn Wrap and Sicilianizza tie for my fave) and I’ve been wondering if I could do something like this at home. I’m hoping they have jackfruit at one of the City Market grocers this weekend! 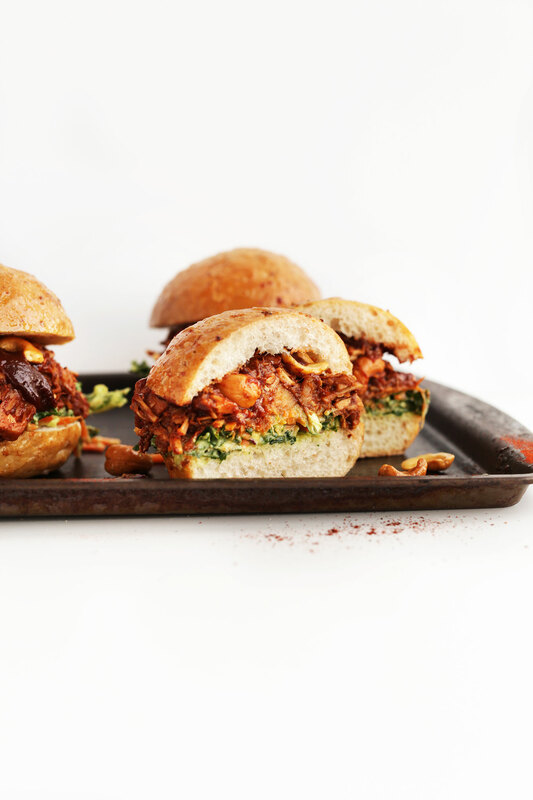 We had a BBQ Jackfruit sandwich similar to this at our local Vegan place and fell in love. SO we ran out and bought a Jackfruit, and now we are sitting on it because I have no idea what to do with it! All of the recipes I have seen call for canned. I don’t even know how to cut it, lol! What to save? What to throw way? I am clueless….SO, once we figure out what to do with this monster, I will be making this recipe. It looks amazing! It makes a triangle shape. Cut out the center, firm part as that will make the sandwich touch. You want to only keep the stringy look parts! Think of it like coring a pineapple! This looks soooo yummy! It even LOOKS like pulled pork! I’ve never thought to make something like this with it though, so interesting! Need to give it a go! I’m living in Sydney now so need to figure out where I can get mine from.. Thank you! BBQ is really the only thing I miss since I stopped eating meat, and I’m pretty sure the only thing I actually miss is the sauce. This looks perfect! looks great, and i have a can of jackfruit so i’ll be giving it a go soon. 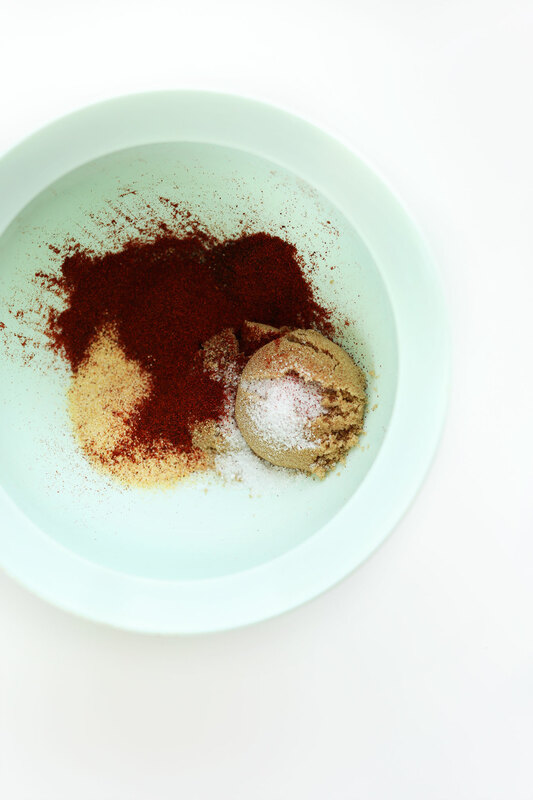 quick question – do you use smoked paprika or regular? thanks. I tried last night using the exact can you posted the link to on Amazon (lucky me the market I went to had them for $1.09)… anyhow, they came chopped. In your post you mentioned taking out the core… there were seeds in the middle that I took out as well as a “pineapple like core” that I had to cut off from random pieces. I’m not sure If that was the section you were talking about. Is that part edible? Also, there was a few pieces that had “cantaloupe like skin” on the outer edges.. did you cut those off too?? Also.. the sandwich was very tasty. Thanks for sharing as always! Hi Risa! The middle core is edible but not ideal texture wise in this recipe. I got my Jackfruit at an Asian store so haven’t tried that one on Amazon, but you definitely core it like a pineapple. Any other “suspect looking” part go ahead and remove them. So glad you enjoyed it! For anyone having a hard time finding jackfruit in water, I used the brine version and it turned out great. After going to multiple Asian markets I finally did find one that said “jackfruit in water,” but it had 3 times the sodium of the “jackfruit in brine,” so I got the brine version (Aroy-D). I did squeeze each piece in paper towels to get all of the water out that I could. Was anyone able to find jackfruit in water with no salt added? Anyway, it turned out really great! I made it for my parents and though they both eat animals, they really enjoyed this vegan meal. Jackfruit works SO well, the texture is spot on. The slaw was really delicious as well.Thanks for the great recipe! Thanks for sharing that Sammi! I need to make this recipe the night before to have it ready for an event the next day. Do you think it would be possible to make this in a crockpot? If so, would you recommend adding more liquid or altering the recipe in any way? I do. I think you could put it on low overnight with the BBQ sauce. And then a couple hours before serving, turn it on high to dry it out. Then keep on warm until serving! I’m not even a vegan and I would choose this over a meaty sandwich any day!! These look sinfully delish!! Cheers! Another frequent visitor and Columbia, SC resident here…neat! I cannot find Jackfruit packed only in water, the one i found is water and salt. Any suggestions? If yours is salted, just wash and drain it thoroughly! In my home we have a saying that has become a mantra: “Trust the minimalist baker.” There were many times in executing this recipe where we thought we had better ideas, but following these instructions to the T turned out perfectly. This recipe is unbelievable in how it resembles actual pulled pork. What even is jackfruit?!?! Thanks Connor! I’ve since had some people try it in brine and said they just rinsed it thoroughly and dried it and it worked well! I just know that brines can usually affect the flavor quite a bit, which is why I didn’t recommend it. But if it worked OK, then that’s great! Thanks for sharing! Hi – I bought a case of canned jackfruit a while back but never knew what to do with it. I was excited when I saw the recipe, until I read that my cans were in brine. So, if I want to try it (what else am I going to do with all this jackfruit? ), you suggest that I rinse all the brine off and then pat dry? Thanks for posting an awesome looking recipe! Yes! Just soak the jackfruit in water and pat very dry! Ahhh I heard of jackfruit but wasn’t too sure about how to use it! These look INSANE! I love pulled pork sandwiches even though I don’t like most meat, and they’re one of the reasons I couldn’t go vegan. But if I had these?? YES. So much better for you than meat, too! And the avocado slaw? GIRL. I am completely blown away by this recipe! You’re a genius!!! Too kind! I’m simply the messenger of brilliant vegan minds gone before me. Hope you give this one a try, Gaby! Drool… Can’t wait to try this out. I bought a fresh jackfruit and made this recipe and the one from your cookbook. My first attempt was good, but the jackfruit was soft. The second attempt I followed the directions and then spread it on a cookie sheet and baked it at 425 for about 20 mins. Perfection. I’ve thought of doing that! Great tip! The answer to my question! We have heaps of fresh jackfruit here on Maui and I was hoping someone had figured out the technique for employing fresh rather than canned. Hi I live in Indonesia and its easy to make this with fresh YOUNG (unripe) jackfruit. You cut the ‘meat’ out of the inside of the jackfruit, leaving the core. Then you boil the pieces and the seeds in salted water for around 10 mins. After that, it’s the same as what you are buying in your canned version, just a lot cheaper. Where did you buy the jackfruit? An asian store just outside of Portland! Woah! I’ve been wanting to go vegan for so long but I was worried about giving up things like pulled pork. I need to try this ASAP. WHAT. I’m in shock over this. I did not know we could eat fruit instead of meat in a sandwich! I’m signing up!!! I have never heard of jack fruit, but now that I know what it is and how well it mocks meat, I have a million and one ideas of how to substitute it in traditionally meat recipes! I can’t wait to give this a try!!! Right? It is kind of amazing. Hope you’re able to find some!! These sandwiches look positively DEE-lish! Never would have thought to add jackfruit in these!! Pinning this for later! This looks so much like meat it’s ridic! I need to hop on the jackfruit train and ride it all the way to this sandwich. DO IT. And report back! I love it, have to give a try. I stopped eating meat three years ago, this makes a great replacement. Thanks for sharing, I’ll be giving a try this weekend. I grew up on a ranch in Montana where we raised over 300 head of Black Angus cattle, so I often state that there is no way I could ever become a vegetarian. However, after this recipe, and your fabulous photography, I might have to rethink this vegan thing. :-) Holy cow! just curious, do the nutritional include the bun? thanks! I’m so excited to make this! I went to Whole Foods today and they only had the jackfruit in brine…any tips on how to make it work if you can’t find it packed in water? Sorry for the confusion Nicole. You could try and soak it in water overnight to get out the brininess flavor! Let me know if you give it a try. I will try that suggestion and let you know! Thank you! I just made pulled jackfruit with the brined type, and it was fine! You just have to remember to add less salt during cooking. I didn’t use a pre-made barbecue seasoning, so that helps. Glad to hear the brine doesn’t ruin the recipe. I’ve been wanting to make this recipe for a while and finally had time to stop at my local store and both brands of young green jack fruit they carried were brined so I got some and was hoping I could soak it but worried it might not be enough. These look so good!Just recently tried jackfruit and would be very,very willing to try it in barbeque.Such an interesting food.Once you taste it you wonder why you don’t eat it more often. Whoa, this looks amazing! I once had jackfruit carnitas at a vegan restaurant and thought I was eating pulled pork. I am making this as soon as I track down some jackfruit! oh my gosh, it looks just like pulled pork! Crazy! I’ve heard of jackfruit, but never as a meat sub. I will have to try it! So interesting! I cant’ wait to try this after a trip to the Asian market. Thanks! I love jack fruit! It really is one of those vegan miracle foods. Last summer, my (omnivore) boyfriend and I had a little cook off. I made pulled jack fruit, and he made pulled pork. We brought both dishes to a big get together with friends and no one could tell the difference! Which, considering that mine was considerably less expensive, lower in calories, and also didn’t require me getting up at 6am to turn the slow cooker on for it to be ready – I’d say results in jack fruit being the victor of that dish off! I can’t wait to try it again with this slaw you’ve posted. Yum! Isn’t it crazy!? Jackfruit is amazing! Thanks for sharing, Kathryn!! Dana, I’m salivating!!!!! I need this in my life right NOW :) amazing post, you’re the queen of food blogging! What a genius idea, Dana! I had no idea that jackfruit was a legit replacement for meat… so good to know! And these sandwiches look delicious. How interesting to use jackfruit! I pulled up your page just to see what I was going to be making for dinner tonight. (Because your recipes are THAT dependable). And my first thought was “heck yeah barbecue!” But then I was like, “wait….that’s jackfruit…” I’m going to give it a shot though. I’m so happy to have a use for some of those random things I see at the Asian Market. Perhaps I’ll see Mary Beth there since I’m also from Columbia, SC! This looks epic! Thanks for solving my strange sloppy-joe style craving I’ve been having with the recent warm weather. Going to have to try this out, for sure! haha, sure! Hope you love it Savanna!